SpaFinder, Inc., the global spa resource, has announced that Kempinski Hotel Grand Arena Zalez SPA and Wellness Center has won the coveted SpaFinder Readers’ Choice Country Award for Favorite Spa in Bulgaria. The award is given for second consecutive year after winning in the same category in 2010. The Zalez Spa Center offers a full range of traditional and exotic massages, as well as skin and body spa procedures based on Terrake and Thalgo products. 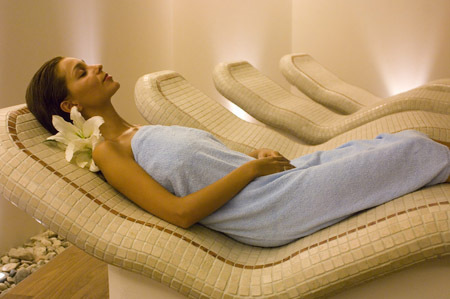 This is also the single Bulgarian location, which offers treatment with Ligne St Barth products. The state-of-the-art facilities include outdoor & indoor swimming pools, indoor & outdoor hot tubs, outdoor tennis court, 2 types of steam baths- Hammam Steam Bath and Aroma Steam Bath, 2 types of saunas-Finnish and Bio Sauna, fitness centre, solarium and a unique snow room. The 2011 Awards were based on votes submitted worldwide at SpaFinder’s global consumer websites (including SpaFinder.com) and by readers of SpaFinder publications. Voters were asked to cast ballots only for spas they’ve personally visited within the past three years. “Given that there are more than 13,000 getaway spas (hotel, resort and destination spas) worldwide, being chosen by consumers, who are the true experts, is cause for celebration and a remarkable achievement,” said SpaFinder President Susie Ellis. This year winners were named for 44 countries and regions, with four new countries (Israel, Jordan, Mauritius and Vietnam) added to the list, underscoring just how vibrant the expansion of spas around the world has become. Readers of SpaFinder publications and visitors to SpaFinder.com also named their favorite spa on each of six continents, along with their choices for “Top 10 Spas” in 32 popular categories, such as “Best Fitness Program,” “Best for Romance,” “Best for Weight Loss” and “Favorite Spa Treatment.” “This recognition makes us very proud and gives us the motivation and wish to maintain the high level of service we are offering to our customers. We will do our best to prove the trust of our guests and to provide unique five star experiences in the future” remarked Mr. Orlando Stefani, the General Manager of Kempinski Hotel Grand Arena Bansko.